According to a legend, a Benedictine monk broke his vows and committed all kind of sins being condemned one of the most cruel punishments of his time: To be walled up alive. When the monk heard his sentence a great fear fell upon him and, in order to be forgiven, he promised the monks who judge him, to write in one single night a book that glorifies the monastery and the greatness of human knowledge. The monks agreed to his request and the monk had the opportunity to write the monumental manuscript, however, by midnight he realized that it would be impossible to complete his work in one single night. Terrified by the punishment that awaited him, he made a pact with the Devil and he offered his soul in exchange for being able to finish the book in the required time. 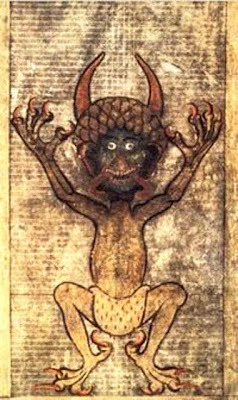 The Devil agreed to his petition and he was the one who finished the manuscript, later on the monk added a picture of Satan on the page 290 as a sign of gratitude for helping him. 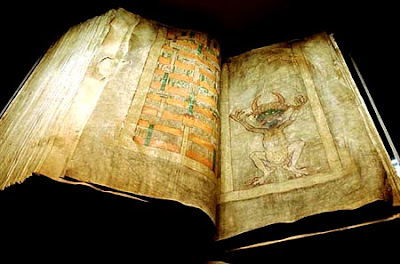 According to the researchers who investigated the manuscript, the Codex Gigas was written by one man, and he could have ended it in about 25 or 30 years. Who wrote this manuscript? Why was it written? How long did it take to be written? When was it written? And What was its purpose? This manuscript has the characteristic that the Devil is depicted on its pages, The book contains the Old and New Testament, two works of Flavius Josephus, Etymologies of Isidore of Seville, the standard textbook for the teaching of medicine in the Middle Ages known also as Ars medicinae (The art of medicine), Chronica Boëmorum (Chronicle of the Bohemians) XII century Cosmas of Prague and a calendar. It’s particularly interesting the section that gives testimony of the Bohemian origin and its turbulent story. In the late sixteenth century, the Codex joined the collections of the ruler of Habsburg, Rudolph II. During the Swedish siege of Prague at the end of the Thirty Years’ War in 1648, the manuscript was taken as war booty and moved to Stockholm. Ruanel: The book was misinterpreted... It was not the work of one man, but the work of a team of religious scholars of past centuries. Interlocutor: When did they start to write it? Ruanel: They started in 1325. Interlocutor: Were Benedictine monks those who wrote this manuscript as people say? Ruanel: No, not Benedictine monks, they were simply monks, but not from that religious order. Interlocutor: How many members were part of this group of researchers? Ruanel: At the beginning there were eight, but then the group was reduced to seven because one died of fever. Interlocutor: How long did they take to finish this book? Ruanel: Not too long, exactly seven years and seven months. Ruanel: Yes, they are not old... The text is one thing and the pictures are another different thing. Interlocutor: Ah! So this book was "rejuvenated" like the Piri Reis map was? Interlocutor: How do you judge this book? Ruanel: It was an important work, but with many errors. Interlocutor: You mean that this is not a nearly perfect work as some researchers said? Interlocutor: So, the reason that these researchers said that the work was made by one man was because they wanted to make it somewhat more important? Ruanel: No, not at all. They mistakenly reached that conclusion. Interlocutor: Then, the Codex Gigas was the work of a group of monks and there is no mystery about this book? Ruanel: Yes, there is no mystery. Interlocutor: How many pages were added to the original manuscript? Ruanel: They added a few pages, it was changed very little and obviously the original book had no pictures. Interlocutor: Is there something else to say about this manuscript? Ruanel: Yes, it’s important to say that the Devil does not exist and the image about him is entirely fanciful. Interlocutor: Well, I will conclude this matter here. This entry was posted at Sunday, December 11, 2011 and is filed under History, Secrets . You can follow any responses to this entry through the .